An article written two months ago, or one that was published a few years ago can be found within a matter of minutes. The best part is that you probably already own the equipment to do it. A computer or tablet that prints to an "All-in-One" printer or one that has scanning ability is the equipment. The OCR program can be found as a free download though an Internet search. 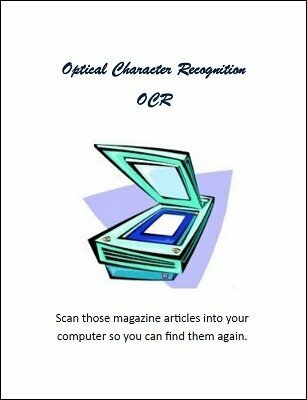 This ebook introduces you to OCR, provides examples of how it can be used, and gets you started digitizing those articles. Applying this technology avoids the magazine shuffle.